Employees pay little attention to what’s on the walls, they watch for what they see and hear in the halls. Want to test that supposition? Ask 5 random colleagues to in some way articulate your company vision or mission statement – or even the priorities your firm has publicized as being essential to your success in the future. Oh, you’ll get answers – and they will vary greatly. I might go so far as to suggest the range would be just as broad if you asked senior leaders. Long, rambling statements of purpose can – often are – LOST. The power of simplicity is profound…if you can’t say what’s most important in a few simple sentences your chances of engaging a work force diminish greatly. Insight #1 – Save the eloquence for the financial world. Make your reason for being elegantly clear. Which takes us to the second factor at play for most organizations. I call it the M.A.M. 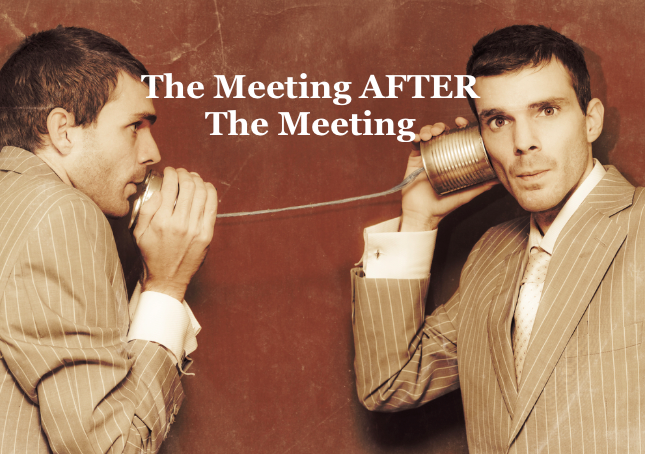 – which stands for Meeting After the Meeting. It’s in the M.A.M.s that company cultures are either built…or deconstructed. The Meeting After the Meeting is a gathering we have all participated in – it’s the one that follows the formal meeting– but without the company doggerel or positioning statements. It’s when employees gather to break down what they just heard – the lunchroom debrief, the flurry of text and email messages, the treadmill give and take, the phone calls, etc. Said another way – it’s where the straight talk really unfolds. I call them M.A.M.s for a reason – they are real, they are potentially powerful, and they take place after every “sanctioned” meeting your company will ever conduct. I believe they are just as important as corporate strategies, mission statements, or balance sheets. In some companies they become far more important than the legitimate meetings. And all too often they remain locked away – far from the public forums. Why? Because despite all our talk about transparency and mutual ownership there is risk in allowing a free exchange of dialogue. It’s easier to simply push it aside. Our challenge – in every company – is to find a way to get M.A.M.s into the light of day – to get the real issues people want to talk about, need to talk about – into forums where they can be addressed. And then he would shut up. After a few of these meetings participants began to feel comfortable that he really wanted to know – and yes, people began to offer opinions they would have otherwise kept quiet. The M.A.M. moved from the dark corners into the light. The effect was amazing. M.A.M.s slipped away. They were no longer needed. They had moved INSIDE. Insight #2 – Want to test your company culture? REALLY test your company culture? Pay close attention to the M.A.M.s. Remember, people don’t pay attention to what they see on the walls; they pay attention to what they see and hear in the halls!